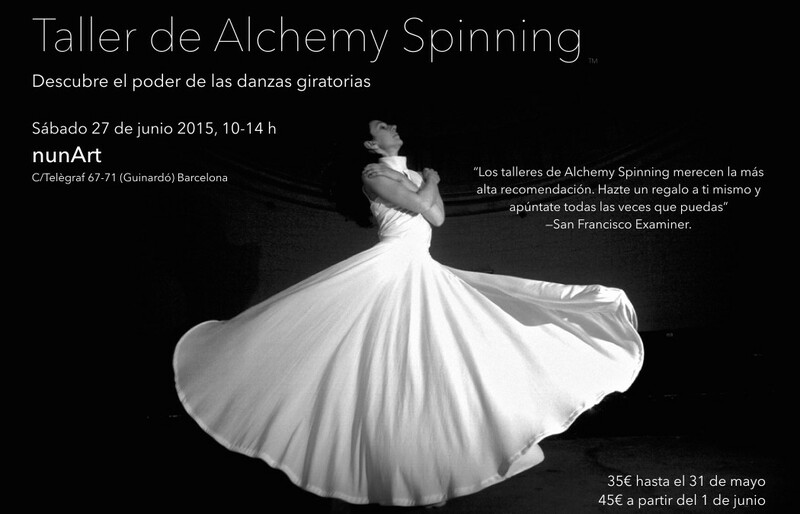 Discover the power of whirling with Alchemy Spinning™ at NunArt on June 27th, 2015. For the first two thirds of the workshop we will work on several exercises that combine dance, yoga, breathing and meditation in order to connect deeply with our own bodies, balance the flow of energy in our chakras and along our spines, and root ourselves firmly in the Earth, while charging up our energy. This is the key to avoid and manage dizziness. The last third of the workshop we will learn basic whirling techniques and we will create and hold a safe space for the participants to spin at will, but each person is encouraged to spin according to their own needs and feelings, entering and exiting the spinning space as they feel compelled to. Venue: NunArt, C/Telègraf,67-71, Barcelona, Spain. Cost: 35€ early bird if you registered before May 31. 45€ after May 31.